Innovative Approaches to Brain Tumor Management is targeted towards healthcare providers who manage and treat patients with brain tumors. 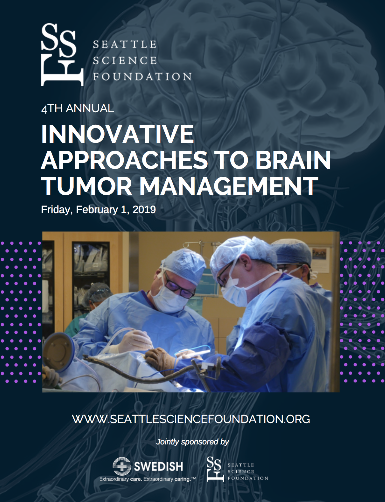 Leading experts in the field will come together to discuss the future of brain tumor management including the progress in personalized medicine and implications of immunotherapy in specializing treatment. This course is designed to focus on the future of brain tumor therapy with the goal of improving treatment response rates, outcomes, and overall patient care. Unable to view registration form below? Click here. Charles Cobbs, M.D. & Zachary N. Litvack, M.D. The Role of Cytomegalovirus in Tumorigenesis – Potential Treatment Target? John M. Henson, M.D, M.B.A.
Sunit Das, M.D., Ph.D., M.A. John M. Henson, M.D., M.B.A.
James Markert, Jr., M.D., M.P.H. A paradigm shift has occurred in the evolution of how we treat patients with brain tumors. In recent years, researchers have found some changes in genes, chromosomes, and proteins inside brain tumor cells that can be used to help predict a patient’s prognosis, or help guide treatment. Recent advances in imaging, surgical approaches, and laser therapy have made surgery for brain tumors much safer and more successful. And, in 2016, the World Health Organization issued a major restructuring of how tumors of the central nervous system are defined. Despite the advances in brain tumor diagnosis, treatment and management, there is a formidable quality gap in the lack of dissemination, comprehension, and application of the latest evidence and practice recommendations. The U.S. Institute of Medicine reports that scientific knowledge about best care is not applied systematically or expeditiously to clinical practice. It takes an average of 17 years for new knowledge generated by randomized controlled trials to be incorporated into practice, and then the application is highly uneven. Following guidelines should be of primary importance; failure in guidelines implementation has a strong influence on appropriateness of care, clinical efficiency, healthcare costs and patients’ quality of life. Surveys of clinicians have shown that a major barrier to using current research evidence is the lack of awareness of new guidelines and the time, effort and skills needed to access the right information among the massive volumes of research. Recognize the role that gene mutation (loss of function, gain of function, amplification) and promoter regulation play in the clinical and histologic behavior of primary brain tumors. Outline the role that viral infection and viral DNA play in tumorigenesis. Identify potential uses for tumor stem cell screening in devising personalized treatment plans. Understand the roles that both ionizing and non-ionizing radiation have on treatment of human glioblastoma and other tumors. Recognize the impact advanced MR, in-vivo fluorescence and in-vivo spectrographic imaging techniques have on progression free and overall survival. Identify patients who may benefit from advanced mapping, augmented reality and minimally invasive surgical techniques over more traditional surgical approaches. This course is intended for neurosurgeons, neuro-oncologists, medical oncologists, neuroradiologists, radiation therapists, and allied health professionals who specialize in the treatment of patients with brain tumors in Washington, Alaska, Montana, Oregon, and Idaho. This activity has been planned and implemented in accordance with the accreditation requirements and policies of the Accreditation Council for Continuing Medical Education (ACCME) through the joint providership of Swedish Medical Center and the Seattle Science Foundation. Swedish Medical Center is accredited by the ACCME to provide continuing medical education for physicians. Swedish Medical Center designates this live activity for a maximum of 7.5 AMA PRA Category 1 Credits™. Physicians should claim only the credit commensurate with the extent of their participation in the activity. This symposium is financially supported in part by educational grants in accordance with ACCME’s Standards for Commercial Support. At the time of this printing, a complete listing of commercial supporters was not available. Appropriate acknowledgment will be given to all supporters at the time of the symposium. The Seattle Science Foundation is located at 550 17th Avenue, James Tower, Suite 600 in Seattle, Washington. Parking is available in the garage on 16th Avenue between Cherry and Jefferson at a maximum fee of $16.50. From I-5 (northbound and southbound), take the James Street exit. Travel east on James Street. James will become Cherry Street. Turn right (south) on 16th Avenue. Turn right into the main garage entrance.